As well as offering a comprehensive window cleaning service we also have a team of specialist graffiti removal experts. Although we love the street art around Bristol we also recognise that there’s a lot of graffiti, some graffiti is more destructive than creative. Whether on the outside of an office building or on a private property, we tackle all graffiti using the best specialist graffiti removal chemicals. With a quick response time and competitive charges, we provide a convenient and reliable graffiti removal service. We’re used often by property management companies and housing estate managers. So if you are looking for a professional cleaning company that offer a quality graffiti removal service email us today for a free quote. As a part of our aim to make our Bristol a cleaner and greener city we are committed to reducing and removing graffiti. Graffiti is a criminal offense. 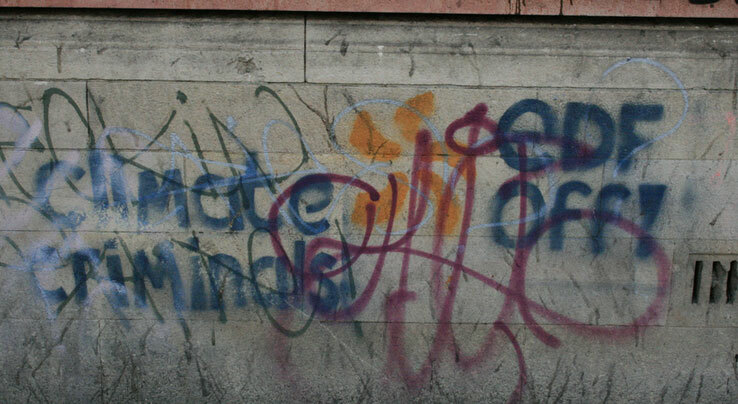 If you are a victim of graffiti or witness an act of graffiti please report it to the Police. We want to help the Bristol City Council, so please share information and report any graffiti offenses, Click Here to Report Graffiti.